Whether you are looking for a simple diamond compression bit to reap the benefits of the toughest man-made material in the cutting tool arena, or have the need for a special application or custom tool, you have come to the right place. Made-to-order diamond router tooling is a specialty of ours, and we painstakingly make sure we have all the details of your application correct to make sure you are not disappointed! The performance of a diamond tool depends on proper design for the intended use, choosing the right grade of PCD, and ensuring that the tool body is engineered to stand up to the exceptional long life of the diamond cutting edge. 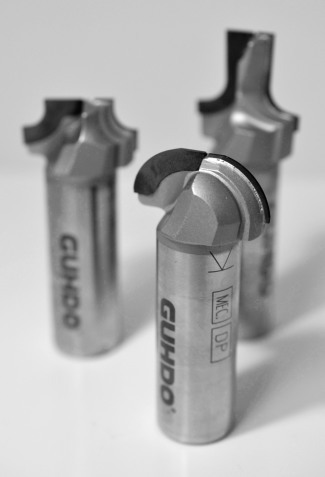 At GDP|GUHDO, you have over 3 decades of diamond tooling technology to benefit from! Our single flute diamond bit features a short upcut, suitable for nesting cuts. Cutting edges shear toward the center of the material in an up/down angle, to provide a very clean cut on laminated materials. This bit can be sharpened approximately 4 times when used under normal wear conditions and can be run with a feed rate of up to 200ipm. Our 2 flute diamond bit features a short upcut, suitable for nesting cuts. Cutting edges shear toward the center of the material in an up/down angle, to provide a very clean cut on laminated materials. This bit can be sharpened approximately 4 times when used under normal wear conditions and can be run with a feed rate of up to 650ipm. The DIASTART 2 flute disposable PCD bit features a solid carbide tool body and a short upcut, suitable for nesting cuts. Cutting edges shear toward the center of the material in an up/down angle, to provide a very clean cut on laminated materials. Feed rate of up to 600"/min. Our 3 flute diamond bit features a solid carbide tool body and a short upcut , suitable for nesting cuts. Cutting edges shear toward the center of the material in an up/down angle, to provide a very clean cut on laminated materials. This bit can be sharpened approximately 4 times when used under normal wear conditions and can be run with a feed rate of up to 900ipm.